With the coming of summer in Tokyo, the season of fireworks start with the peak of the season from the end of July to the middle of August. Japan is famous for it's variety size of the fireworks, as well as the stage effects. If you're in Japan this time of season, it's a must-see. 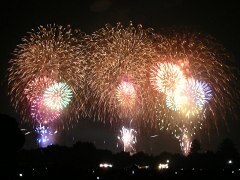 Here's a list of links that provide useful information on fireworks in and out of Tokyo. This page contains all entries posted to Cycle Tokyo ! Weblog in July 2007. They are listed from oldest to newest.